Sydney performer and songwriter Ace Fender passed away in hospital on the morning of Saturday September 29th, from heart-related problems. Ace would have turned 55 on the 3rd of October. Ace was an accomplished songwriter: his songs have been recorded by Lucky Grills, Jade Hurley (Don't Ask Me To Stay) and amongst his most popular compositions was Rock 'N Roll In A Cowboy Hat (recorded by Slim Dusty on the Country Way Of Life album). Ace won the 2001 TIARA Songwriting award with I Can't Bring Myself To Leave You For Real, and he had previously won this Award in 1998 for In A Moment. 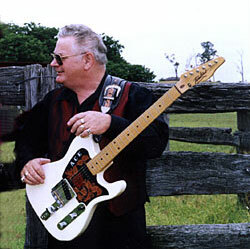 As a performer, Ace led the Misty Mountain Showband who received nominations for both ACE and MO awards. The band was originally known as Blue Misty, the backing band for Ivy Somerfield. Ace and the band continued after Ivy's premature death in 1991. Ace also worked as a duo with Linda Miller with whom he had just released a new CD, Friend and Partner. As well as performing and songwriting, Ace and his wife, Maggie Smith ran the ACE Recording Studios, where many independent artists cut their albums and where he also taught several music students and encouraged young talent. Maggie is herself known as a manager of artists and a much-beloved identity of the Country Music scene. Bert Newton paid special tribute to Ace on his TV show, on the Monday after Ace's passing, and Jade Hurley then dedicated a song to him. At Ace's funeral in Liverpool, Sydney, over 400 people filled the All Saints Catholic Church. As well as his family, there were fans, line-dancers, club managers and agents, and many artists and musicians whose lives had been touched by Ace Fender. Produced by Ace Fender, Maggie Smith, Glen Bain.